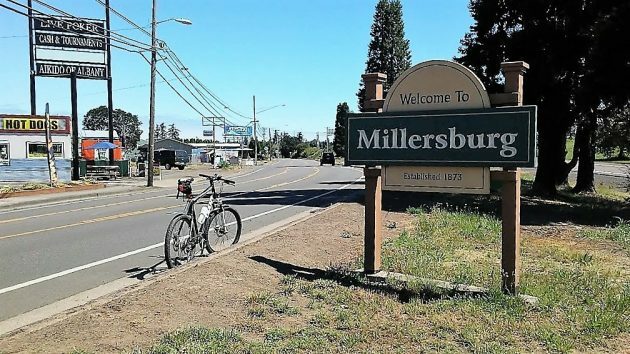 » Millersburg: Change fire service? Right about here, on Old Salem Road, is where Albany ends and Millersburg begins. Millersburg is considering making a change in its arrangement for fire protection, and Albany, being its bigger neighbor, has a more than passing interest in the change. The Millersburg City Council will hold a public hearing at 7:30 p.m. Tuesday (Sept.12) on withdrawing from two fire districts, Albany Rural and Jefferson Rural. The Albany City Council heard about it Monday from Fire Chief John Bradner. The northern part of Millersburg is part of the Jefferson fire district. The other part, roughly south of Conser Road, is in Albany Rural, which in turn contracts for fire protection with the city of Albany. This makes the Albany city fire department responsible for responding to alarms — fires, rescues, but mostly medical emergencies — for the part of Millersburg that includes ATI and other big industries. As Bradner explained it to the Albany council at Monday’s work session, Millersburg wants to be covered by one agency rather than two. Apparently one reason is that 911 calls in the Jefferson district are routed to a dispatch center in Woodburn, adding minutes to any emergency response time. If Millersburg gets out of the rural districts and contracts directly with Albany, the change could take effect on July 1, 2018. Bradner says there are advantages to Albany in becoming the agency covering all of Millersburg: One, it would not lose the revenue it now gets from the Millersburg portion of its contract with Albany Rural. And two, it would get added revenue by covering the area Jefferson now has. The rural districts contracting with Albany Fire — Albany Rural, North Albany Rural, and Palestine Rural — pay the city $2 per thousand dollars of property value. That’s roughly the same fire tax that property owners within the city paid when this rate was agreed to a few years ago. Albany Mayor Sharon Konopa says that if and when it comes to negotiations with Millersburg about providing fire service to all of the neighboring town, she wants Albany to recover all its relevant costs. She says this might mean making Millersburg pay a proportionate share of the bond costs for Albany’s new Station 11, the main fire station on Lyon Street now nearing completion. The original version of this story has been edited to change the last paragraph to what it says now. Following good accounting practices, any contract for services should include all relevant costs, as Mayor Konopa said. This would include capital improvements which benefit any who receive general services from the district. New fire station? Just what we need: another bond measure. This is what I posted elsewhere; This has been discussed for a year and there were two public meetings about this 6 weeks ago. It amazes me how people get all upset but also were not involved and staying informed on the issues. Basically; Jefferson is mostly volunteer and they are having trouble getting volunteers. Dispatch and response times are bad. Training is not as good as AB Fire. Their future levy increases will push their rate to over 2.00 per K. Albany has 17 staff on duty 24/7, certified, more paramedics, more equipment, better training and they can handle the hazmat fires here that Jefferson can’t. From a service point it’s a no brainer and most citizens at the meetings agreed with this proposal. AB response time is also bad, due to distance, but the City plans to build a fire station using existing funds (*) and then AB will staff it. Response time solved and we will have staff and a paramedic right here ! Jefferson does not staff the old station here. AB is 2.00 per K., Cheaper not more. My concerns; project cost overruns, maintenance costs not discussed, how long will AB guarantee the 2.00 rate ?- not discussed. We will no longer pay tax dollars to Jefferson RFD. The city tax rate by statute is locked at 3.50 per K. City currently taxes us 1.70 per K. 1.70 + 2.00 for AB Fire = 3.7O so the city will eat 20 cents per k from existing budget (easy to do as they don’t use it anyway). However, how long can the city operate at this 3.50 rate ? It has not been discussed. With all the dream projects the city has and the new staff they keep hiring…how long until we are voting for a tax base increase ? Has not been discussed ! So switching to AB fire would be better service. My concern is cost increases down the road. And as pointed out by some…there are some potential conflicts of interest going on too. *: Build from existing funds will lower our carryover unused monies. If we get too low on carryover funds and it has been said we have a big sewer plant upgrade bill ahead…. then possible tax increase or sewer rate increases. Upon reading Hasso’s article, the Albany Mayor may expect Millersburg Residents to pay for part of Station 11’s levy. Doing so would be completely unfair (we had no opportunity to vote on it) and that would make this change UNAFFORDABLE. It would then be a NO for me. I can’t believe I am saying (typing) this, but I agree with Craig. We need better response times and more consistent service and protection. I would assume this has an effect on our home owners insurance. I am concerned about the cost and how to contain it from skyrocketing in the coming years. We have other needs in our community. Eventually we will have to discuss our public safety plan and how we have 24/7 coverage there as well. Mayor Konopa’s comments are absurd and if she pushes for that cost to even be fractionally covered by Millersburg, we’ll have to come up with another plan. If we come with another plan that is affordable, it will absolutely encompass the industry part of Millersburg and that will be a revenue loss for Albany. I would think that Mayor Konopa would be a little more collaborative and measured than she reportedly was. It is exciting to see Millersburg coming up with solutions to some of our issues that have needed to be addressed. I have confidence in our elected officials to make the right decisions. It is also reassuring to know that community involvement has increased over the last several years. Jason, we may have more in common than we both think ! ;o). My biggest concern moving forward on everything is costs to residents. Over half of Millersburg is at retirement…fixed income, including myself. We need to be careful that we don’t harm this group or growing families with ever increasing fees and tax burdens. I am still advocating for some sort of news letter. The Reader Board is useless for getting information. It is so congested at that corner a person doesn’t dare slow to read what is on it. Telling me City Hall would be closed July 4th doesn’t qualify as an emergency! A letter could be put in the occasional water bill or the quarterly sewer bill at much less cost than the Reader Board. I read about this meeting, which I plan to attend, on the Millersburg Facebook site. If you or your family is in need of fire/ems protection, you’d better hope there is a professional coming to help you and not a collage student / weekend warrior crew.